Serving a population of slightly more than 33,000 (Rosemère, Lorraine and Bois-des-Filion), the plant produces, on average, 500 litres/person/day. Meeting the high standards of the Water Treatment Excellence Program, the technicians in sanitation see to it that you are provided with water of superior quality every single day. To this end, the water is treated in several steps using specialized equipment including a screen rake, two mechanical agitators, two dynamic settling tanks, six bilayer gravity filters (sand and granular activated carbon), two drinking water storage tanks, two electric generating sets, one process computer, two compressors and boosters as well as one telemetry system. What is the water’s hardness level? 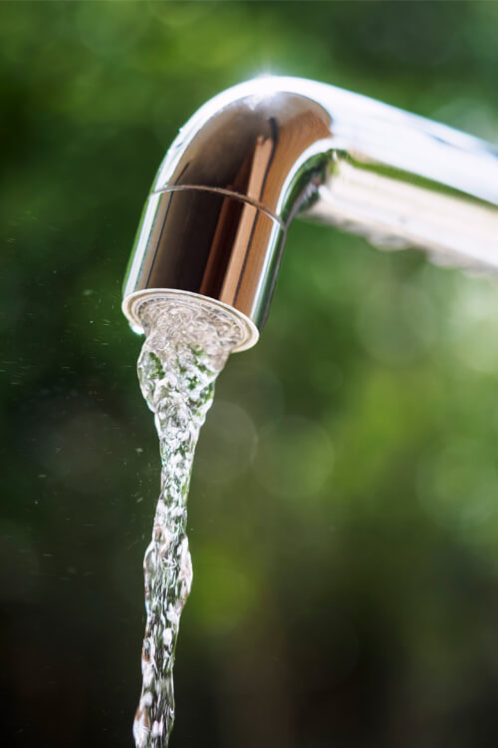 Is water from the water treatment plant fluorinated? The chlorine is added to water to neutralize bacteria, viruses and other organisms toxic to your health. Solution: if the taste and odour are too strong, let the water sit in the refrigerator (in an uncovered glass pitcher) before drinking. This phenomenon is caused by tiny air bubbles trapped in the water, similar to bubbles in carbonated drinks. This occurs mainly in cold weather when the water heats up in the pipes or hot-water heater. This degassing is normal and has no impact on the quality of the water. It can therefore be safely consumed. Solution: let the water settle in a glass for several seconds to allow the gas bubbles to evaporate. This is a common problem resulting from the growth of bacteria on moist surfaces, which are omnipresent in our environment. The accumulation of these bacteria is called a biofilm. It can be different colours: pink, yellow, orange. The problem is purely aesthetic since these bacteria are not considered to be pathogenic to humans. Solution: clean the affected surface with a chlorine-based cleaner. You can also add two to three tablespoons of bleach or chlorine pellets to the toilet bowl. Dry the affected surfaces well (shower, tub and sink) to eliminate any trace of moisture. Applying these tips should improve the situation. Water intake The main water intake supplies the water production plant most of the year. It captures the water near the bottom, in the middle of the Mille-Îles River, then channels it by gravity through a 762 mm pipe to the raw water well. With recent climate changes, the river’s low summer flow increases the concentration of ammonia nitrogen at the point of entry and interferes with the quality of the water, making its treatment more difficult. In order to counter this obstacle, an auxiliary water intake, including two 300 mm pipes and a pumping station were installed in 2008 to capture water at 1.5 m from the surface. Raking and pumping Water entering the raw water well in this manner goes through a rake that removes coarse particles, branches, leaves and fish. It is then channelled to the flocculation equipment using six low-pressure pumps with a total capacity of 59,000 m3 per day. Flocculation This step consists in adding a coagulant and coagulant-aid that will clump suspended matter in order to decant the water. Two mixers ensure the adequate distribution of products. Decantation The previously flocculated water enters two ultra-pulsation-type settling tanks where suspended matter settles to the bottom. Once clarified, the water goes through gravity filters while the sludge is diverted to the wastewater plant for treatment. Filtration The water is filtered by six gravity filters consisting of a layer of sand and a layer of granular activated carbon. In the final stage of the elimination of suspended matter, the water goes through one of these filters where particles that did not settle at the flocculation stage are removed. Post-treatment Once the water has been filtered, three products are injected: sodium hypochlorite to disinfect it, caustic soda to adjust the pH, and zinc orthophosphate to inhibit corrosion related to the waterworks system. Storage Once the water has been purified, it is kept in underground tanks for a few hours. The amount of water stored makes it possible to both meet the population’s need for drinking water and provide a reserve for fighting fires. UV-ray disinfection The final treatment step, disinfection by UV-ray reactors ensures that water distributed to the population is of excellent quality and meets the standards of the Water Treatment Excellence Program, which exceed those established by the government of Québec. Distribution Once clarified, filtered and disinfected, the water is then channelled to the waterworks system by seven high-pressure pumps with a total capacity of 84,500 m3 per day. Serving a population of slightly more than 24,000 (Rosemère and Lorraine), the plant has a maximum wastewater treatment capacity of 80,000 m3 a day. It monitors the bacteriological quality of water from the Mille-Îles River, strictly complying with the standards established by the Department of Municipal Affairs, Regions and Land Occupancy with regards to the quality of waste. To treat the wastewater, the plant relies on the following equipment: two mechanical screen rakes, two grit chambers, two settling tanks, one UV disinfecting system, two digestors, two centrifuges and one process computer.